Hawaiian Airlines is bracing for industry capacity increases on its North American routes during 2Q2015 ahead of the debut of new flights by Virgin America in 2H2015. At the same time the airline’s international routes are facing some pressure due to the elimination of fuel surcharges and currency fluctuations. Despite those challenges Hawaiian maintains a bullish outlook for 2015 as it works to leverage its dominant position in the inter-island market and embarks on a course of de-levering its balance sheet now that it is taking a breather in aircraft deliveries and long-haul expansion. After stating in late 2014 that it was examining various forms of capital allocation, Hawaiian has outlined a USD100 million share purchase programme now that it has achieved certain balance sheet targets, which provided the airline some flexibility to consider alternative uses of cash. At the beginning of 2015 Hawaiian warned that industry capacity between North America and Hawaii would be at record levels during 1H2015. During 1Q2015 passenger unit revenues on Hawaiian’s North American routes, which represent approximately 50% of its total revenues, fell in the high single digits. Recently Hawaiian chief commercial officer Peter Ingram reiterated the double-digit capacity increases between Hawaii and North America during 1Q2015, and concluded that based on published schedules, capacity growth during 2Q2015 would reach similar levels. Recently Alaska Airlines estimated that its seats on offer from North America to Hawaii would grow 12% year-on-year in 2Q2015. Mr Ingram explained that 1Q is generally a tough seasonal period for Hawaiian, and during the first couple of weeks in Jan-2015 the airline was behind its booked load factor target. As the quarter progressed bookings strengthened, but not enough to “fully overcome a tougher year-over-year pricing environment and the initial deficit book load factor”, Mr Ingram concluded. As the high season for US travel gets underway in 2Q2015, Hawaiian expects to see sequential improvement through the quarter. Mr Ingram stated the airline’s booked load factor was flat to positive in 2Q2015, and Hawaiian projects a better unit revenue performance on North American routes during the quarter. Hawaiian believes some of the capacity pressure in the North American market should ease starting in 2H2015, with growth levelling off to the mid-single digits. During 1H2014 Hawaiian undertook a network realignment of its long-haul operations and eliminated under-performing markets including Fukuoka and Taipei, which helped to improve the performance of its route network in 2014. During 4Q2014 passenger unit revenues on its long-haul flights jumped 11.4%. But the strengthening of the USD against other currencies, lower fuel surcharges and capacity pressure in some markets are creating headwinds for Hawaiian in 2015. Mr Ingram estimated that the currency pressure and the decrease in fuel surcharges should affect 2Q2105 passenger unit revenues by 3.5ppt. Absent those challenges, Hawaiian is seeing year-on-year improvement in its international routes, said Mr Ingram. The company has hedged 50% of JPY and AUD foreign currency exposure at levels that are better than current rates, Mr Ingram stated. 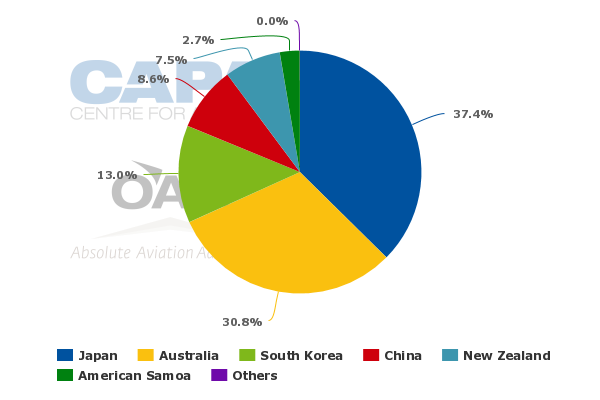 Data from CAPA and OAG show that for the week of 18-May-2015 to 24-May-2015 Japan and Australia combined account for roughly 68% of Hawaiian’s international ASMs. Hawaiian is also tweaking its route network in Japan during Oct-2015 when the airline plans to drop its Sendai-Sapporo-Honolulu flight segment operated three times per week. Instead the airline will only operate the Honolulu-Sapporo routing. The airline told local news outlet the Pacific Business News that it believed the Sendai and Sapporo triangle would work well since the two cities have complementary tourist seasons, but that after two years there was not enough growth to justify the more costly triangular service. Passenger unit revenue growth in Hawaiian’s inter-island operations was flat year-on-year during 1Q2015, and the airline has a similar outlook for those routes going forward. But the inter-island market remains a point of strength for Hawaiian since it is the leading airline operating among the Hawaiian islands. Although those routes represent just 25% of Hawaiian’s overall revenues, the service is a strategic lever for Hawaiian. 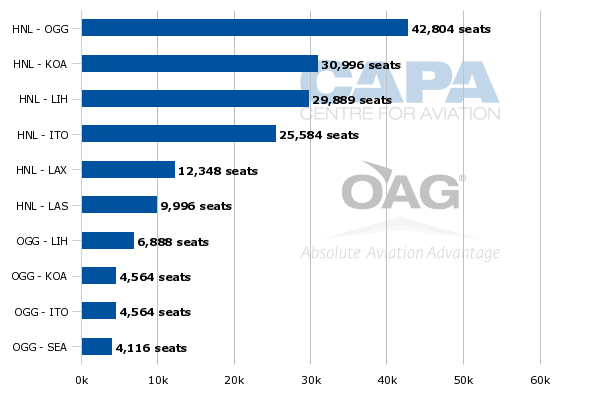 Among its top domestic routes measured by seat deployment, inter-island services account for eight of the top 10. Inter-island routes also represent a good portion of Hawaiian’s top 10 domestic routes measured by frequencies. Mr Ingram remarked that in addition to the local traffic Hawaiian transports on the inter-island routes, the island network adds breadth to its service from North American and its long-haul network. Hawaiian’s extensive inter-island operations are also attractive to other airlines, which have forged codeshare partnerships with Hawaiian. Virgin America has recently announced plans to add service to Honolulu and Maui from San Francisco, creating new competition for Hawaiian. The two airlines have a codesharing agreement, and recently Virgin America CEO David Cush stated he would like to see the partnership evolve to a scenario where codes are placed on beyond flights rather than overlap routes. That would give Virgin America an ability to market a much larger network in Hawaii. Hawaiian’s scheduled passenger unit revenues fell 4.3% in 1Q2015. Among most of the US majors, its decline was the second largest behind Alaska Air Group, which posted a 5.4% drop in passenger unit revenues. For 2Q2015 Hawaiian is projecting a unit cost decline of 1% to 4% on a 3% to 5% increase in capacity. The main drivers for the decline are the lapping of some of the long-haul network changes Hawaiian made in 2014 and continuing pressure from the lower fuel surcharges and exchange rates. Hawaiian’s unit costs excluding fuel are trending up for 2Q2015 by 0.5% to 3.5% and 1% to 4% for CY2015. 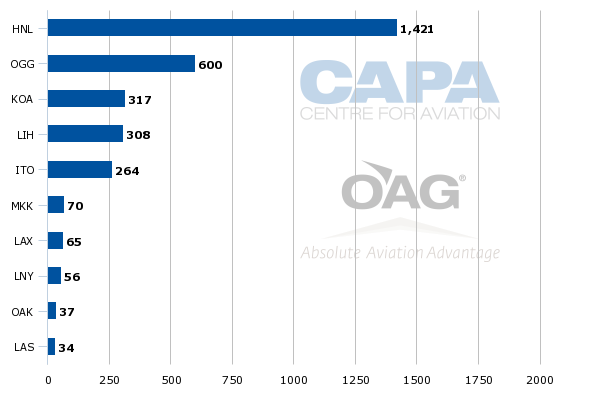 The increase in unit costs is driven by rising pension expense, growth in aircraft lease expense after the delivery of two Airbus A330 widebodies in Feb-2015 and Apr-2015 and cost driven by the return of two Boeing 767s in 2Q2015 and 4Q2015. Although unit revenues and unit costs are trending in an unfavourable direction, Hawaiian has been working to de-lever its balance sheet and studying various forms of capital allocation. During 1Q2015 Hawaiian repurchased 73% of its convertible notes, and together with a repurchase made during 4Q2014 results in 91% of the original amount of the notes being retired. As of 31-Mar-2015 Hawaiian’s liquidity ratio of 28% was in excess of its 23% to 25% target, and its adjusted debt to EBITDA of 3.6x was within its targeted range of 3x and 4x. At the same time Hawaiian’s capital expenditures are falling significantly in 2015. The company projects capex of USD45 million to USD50 million in 2015 compared with USD500 million in 2013 and USD440 million in 2014. Hawaiian will be free cash flow positive in 2015, and has opted to initiate a USD100 million share buyback. It was not totally unexpected after Hawaiian in late 2014 stated its was studying various forms of capital allocation as its balance sheet was strengthening and its free cash flow was turning positive. Similar to most US airlines, Hawaiian grew its top-line profits and revenues during 1Q2015 even as passenger unit revenues declined. Profit growth and margin expansion at most US airlines is driven in part by lower fuel costs that despite claims to the contrary, are driving down pricing in some markets. After years of rapid growth into long-haul markets Hawaiian is now taking a break from its network diversification to focus on strengthening its balance sheet and opting to appease shareholders with a buyback as its de-levering continues. In this environment of increasingly vocal shareholders it seemed like a sound move given it is hitting or exceeding some of balance sheet targets. Even as Hawaiian faces short term unit revenue and cost pressure along with industry capacity increases, it is making the right choices to strengthen its business over the long term as its leverage decreases. It seems as if 2015 is shaping up to be a good time to take a breather - both in network expansion and capital spend.